This is not a post about how to make tallies/clunies. There are many wonderful online tutorials (text, diagram, video) to which I will add links as I go. In this post, I will be giving my own take/options on how to get results easily, what should be absolutely avoided, or why a certain thing is done in relation to particular tuts … just a few tips here & there, that might be helpful to someone starting out – simply to show that one does not have to follow only one style &/or follow it dogmatically. Secondly, these are my first trials & the tallies are not all good or identical. My main aim in learning Cluny tatting is in the potential for free style/ freeform & 3D tatting, & of course the diverse shapes & effects they can create, so I was not too concerned when all my classic oval tallies did not come out identical. There is still a Whole lot of learning, experimenting, & practicing required ! 3. 'cluny' is again a misnomer - the form/element that is woven is called a tally (or leaf/petal), not a cluny. However the latter has taken root (& admittedly, I do like the term ;-P) & is here to stay, but there is no harm in knowing a bit of factoid. Tallies add texture, density, interest, feature, novelty, beauty, …. 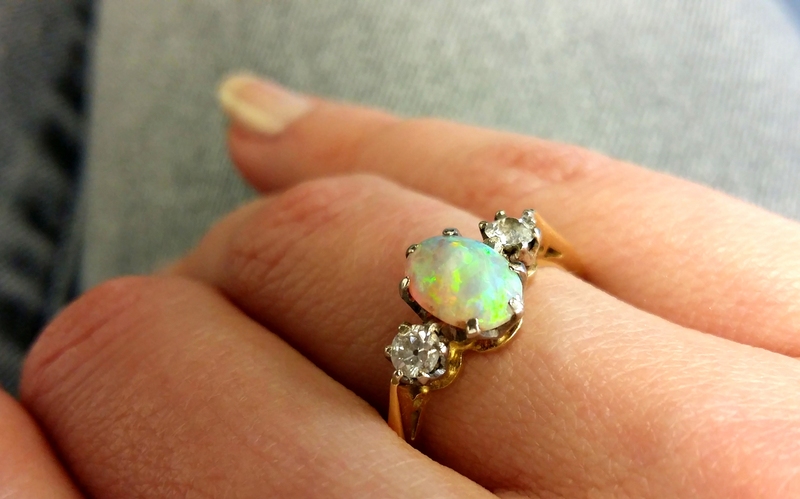 They add a point of contrast between open lace (rings) & filled-in/coloured-in elements/rings . Weaving introduces an embroidered effect, too. But they are Functional as well ! A normal tally will act like a chain or a split ring to carry both threads from one end to the other, thus spanning a space. A hanging cluny/tally will acts like a normal/regular ring where the threads return to the starting point, at the base. Thus, almost any ring or chain in a pattern can be converted into a cluny/tally ! Both types of tallies have the potential for classic oval shape, or for freeform leaf, petal, & even regular Geometric shapes !!! Think of the Vast potential these shapes have/can have in our tatting – whether in freestyle tatting, in 3D, in jewelry, besides the flat 2D usage in doilies, etc. And if a finger loom is difficult to mqke or sustain (“the death grip”! ), then there are varied kinds of looms that can be cut out/made from materials within the home (listed at end of post). Even in a finger loom, I hope some of the tips listed below will help ease the tension in the hand (more on how versatile a single card loom can be in next post). Disclaimer : I am sharing what has/hasn’t worked for me & the lessons drawn thereof. We each have individual styles, techniques & comfort levels, hence these are just my own thumb rules..
Secondly, my experience is limited to barely a month of intermittent Cluny tatting & loads of experimentation is yet to be done. So if you come across any mistakes Please write & point out so that I can rectify the errors. Thirdly, I am still very much in need of practice. As always, please excuse the lack of precision. I am, however, displaying All my trials, including ones with glaring mistakes to showcase some progress & evolution in the learning endeavour.... if I can, You most definitely Can !!! While Cluny Tatting had been on my to-learn list, this video recommendation suddenly ‘loomed’ up in my Inbox motivating me to try it that very instant. Tammie demonstrates Very clearly & slowly, how to make the finger loom first. I wanted to try the finger loom first in order to understand the concept. Once that was clear, it was easy to shift to artificial looms and also to experiment further. The finger loom “worked”, but left my little pinkie all blue. So I switched the ‘loom’ to my bed , wrapping the threads around pins stuck into the mattress. Much easier, but a tad fiddly – so steadied & tensioned the loom using 2 pins for each Warp . And then, Judith Connors graciously offered to mail me her directions for making a loom out of card stock (copyright, but shared on Craftree here). Well, then I Really took off ! It is very easy to maintain an easy & comfortable grip on the tally while weaving; easier to manipulate too. For most of my practice pieces, I have used 2 different colours so that mistakes become easy to spot & work on in future practice. Loom is made with the ball/chain/SH2 thread, forming the Warp (vertical). One can call this the Loom shuttle for convenience. Weaving is done with the core/SH1 (or auxiliary) thread, thus forming the weft/wrap (horizontal). This can be called the Weaving shuttle for convenience. Finger loom – when loom is made on fingers/hand by looping the Warps around fingers. In a 3 Warp/thread loom : inner or 1st Warp (extreme left near index finger) , middle Warp, & outer Warp (extreme left towards pinkie). 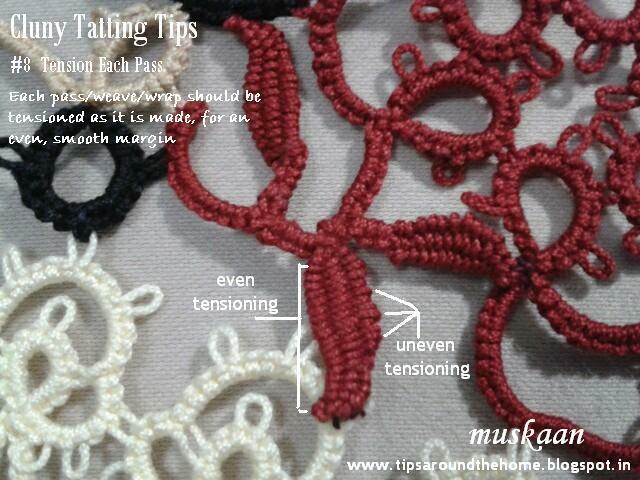 NOTE : Inner or 1st Warp is always the point where the tally starts & is attached to the previous tatting/element. This always remains the same, while the 2nd & 3rd may change if adding more Warps. Card/Box/Artificial/Plastic loom – any artificial loom cut out from card stock, visiting cards, plastic containers, etc. In the discussion, I have used ‘card’ loom for convenience. 1 wrap/weave = movement or pass from right to left & back to right (starting point) ; One can thus assume that 1 wrap = 2 passes in opposite directions. Almost ready to post, and this table bug hit me ! This is a rough equivalence between normal tatting & Cluny tatting . See the similarities ? While the numbering below reflects the steps involved it is more for convenience in listing. 1. Start Tally with A Stitch ? Many tuts mention/show that in order to bring all the threads together & 'lock' them in place, it is preferable to make 1 ds or 1fhs on inner (1st Warp) thread, before the actual weaving begins. They also point out that it is quite difficult to flip the stitch/half stitch. Well, a reverse stitch / Unflipped stitch or half stitch works just as well. I start with a reverse stitch on first Warp (extreme left) of loom, Instead of a ds. Ds is difficult to make – flipping a fairly taut Warp is not easy. RS/reverse stitch works just as well. Confirm that the loom threads are free to move, before proceeding to weave further. Some start with a half stitch (flipped or unflipped) - this works too, but one has to be Real careful when closing the loom due to it's propensity for getting knotted. Best avoided. This step is easily omitted in a card loom where one has more control & grip over all the threads. Also, I did not like the tiny telltale knot at the base, as visible in the close up of the Frauberger Bookmark tail#1 (indicated by arrows in above pic). This is an idea that was buried somewhere in my subconscious from Lilas’ diagrams ! Brilliant in it’s simplicity & practicality ! No more blue fingers !!! … And now, while researching some more for the post, I came across another Great tut by Jennifer Williams who has illustrated the exact technique ! 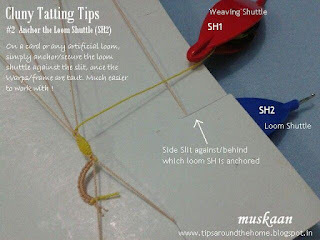 For finger looms, after the Warps are made & tensioned, wind the thread till the SH2 or loom shuttle is anchored firmly behind the fingers as seen in pic. The same technique worked Splendidly on the card loom, with SH2 anchored behind the side slit. It can be left hanging down (not seen in pic)! If one is not comfortable or confident at the very beginning, make one complete weave & Then slip it off. Recall the SCMR where one can leave the loop hanging down after making the 1st ds. 4. Shuttle or Needle ? 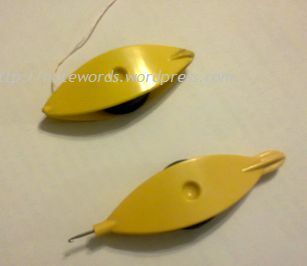 I have used both to do the weaving part. I am very comfortable with the shuttle on a card loom. To avoid the shuttle hook from catching the Warp threads, I hold the back end of shuttle in front & weave..
A long, thick darning needle (or tatting needle, of course) is ideal for weaving with auxiliary thread, as in the case of a hanging cluny. For right-handers, weaving starts from right to left & back to right, by going over or under the Warp threads. While others start with under-over-under/u-o-u (& vice versa on way back). I was a bit confused when comparing some tuts, but the reason dawned on me when Judith shared her loom instructions. Both are correct, depending on how the shuttle (weaving) thread is placed in comparison to the center/middle Warp. Just as in normal tatting, the core thread should be able to slide freely within the ds being made on it, similarly, the loom threads should be free to slide while the weaves are being made otherwise closing will become impossible. Keep checking, especially as a beginner, to see that the weaving is allowing the loom threads to slide easily. Remember, the 1st/inner Warp will be locked in, but all other threads should be able to slide when tugged correctly. Just a tiny tug at the centre & extreme right (outward) loom threads will ensure that no knots have formed. A loom is simply a frame made of Warps, to do & hold the weaving together (just like the core thread in regular tatting). These vertical loom threads should remain taut throughout the process in order to get nicely formed tallies. In case one of the Warps slackens a bit, pull the thread segment/loop that follows/is next to it (towards the Loom/SH2). Any Warp thread can be carefully tensioned in this manner, even when the weaving is in progress, because the loom frame is formed in one contiguous sequence. Notice the taut Warps in each of the images above – whether made on a finger loom or a card loom. Weaving cluny leaves in this manner means having to tension Each pass for a smooth margin . One cannot make multiple passes/weaves & then pull to bring together. It will simply resist, distort, knot over in a crumpled mess. If each pass & wrap is not tensioned, one can see a tiny bump along the margin (see pic below). madtatter80 shares her interesting "dropping" motion for the 2nd pass, which quickens her pace. For a good-looking, evenly woven tally, it is essential to pack down the weaves as they are being made. It can be done with the help of a crochet hook, needle, shuttle point, etc. Or one can hold the Warp threads together in a pinch & push back the weaves (indicated in Fig.7). One thing to be careful about (I realized after some trials) is that if one pulls the rightmost/outer Warp thread too strongly, negligently, or too often, it can distort the curve of the tally, usually flattening the arc. Also, notice the tiny colour blip at tip of some of the tallies where tensioning or packing down is wanting. Opinion varies on whether a ‘tatting’ cluny should be packed down too tightly unlike a bobbin lace cluny. I guess ultimately it is the tatter’s personal definition of what is 'too tight'. Keep tally within a pinch while weaving, especially on a finger loom. (On an artificial loom, one has some leeway. In fact, I often use both hands to weave to & fro on the card loom). This becomes Especially critical when closing the tally. If one relaxes one's pinch there is the heightened risk of getting the threads all in a knot – it is extremely difficult to unravel the knot. I speak from personal experience, where many a cluny got ‘locked in’. When making tallies, many loops have to be closed in sequence, & each one has a tendency to twist . This can be very easily avoided , irrespective of the loom or tally . As each Warp loop is removed from finger/card to start closing, place a steel crochet hook (or any slim but slightly weighty object) into the loop that is being closed . Do this as soon as you remove that loop from the loom. If one starts closing before weighing it down, chances are twisting will start & it becomes more difficult to get it all straight especially if one’s fingers are encased in the finger loom. The steel hook provides enough weight/pressure to the closing loop to keep it from twisting & knotting itself. At the last moment, slip the ‘hook off’ & give the final tug to close the loop snugly. Please note the pics are taken After a lot of closing has been accomplished, although the hook had been in position throughout the pulling/closing process. It is possible to hide thread/tail ends within a tally, but requires some dexterity. Place the tail parallel to the middle Warp & weave as normal. After a few weaves over the tail, tension the tail & continue the rest of the tally . When it is complete & closed, snip off the extra tail end. Since the weaves are packed down, the tail will remain secure within. (image below). Or one can leave enough length in the tail end to sew it through the back of a tally. However, this, again, is not easy if the weaves are densely packed down. In the next post(s) I will cover some of the many shapes that are possible, as well as include stepwise instructions on how to make hanging clunies and 4 & 5 veined tallies on a card loom. For starters, these are an Excellent & vital first step! Clever Cluny (Beginning Tatting Video Series) After watching the 1st half of this video, I will Never forget how to make a loom - on fingers or otherwise ! I was able to continue with my tally after watching just this half ! The 2nd half deals with a cardboard loom cutout. Frivolité à la navette : le point d'esprit (Cluny leaf) : Very soon after this, Julie posted a great video, too ! Although text is in French, the demo is very clear & easy to follow. text is in French but very clear self-explanatory video demo. Another good finger loom tatting resource for beginners. Jennifer Williams’ Cluny Tatting Technique diagrammed with instructions . Another Excellent resource to print & refer for beginners. I only came across it a couple of days back. Lilas Lace diagrams - superb self-explanatory diagrams . madtatter80’s Tatting Cluny Lace... the center SH2 thread is shifted to extreme right, & SH1 is 'dropped' on return for easy & quick tensioning. 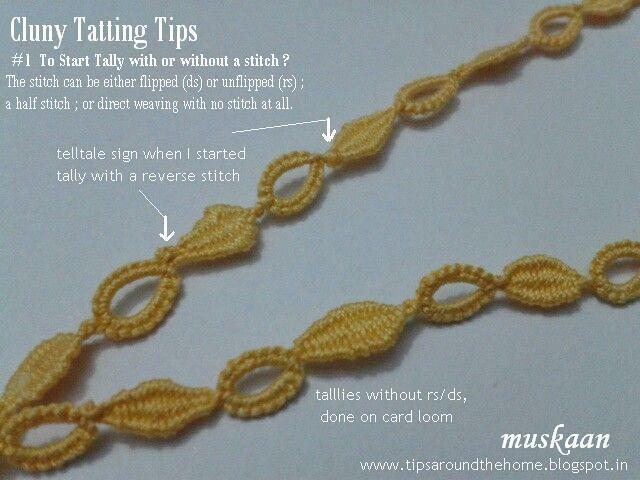 Mimi Dillman’s Cluny Tatting Page with with a list of resources & her pictorial instructions. I love your detailed descriptions of everything you try! I'm still not interested in incorporating Clunies in my tatting, but I do appreciate reading about your adventures. Do appreciate your kind words always . Very comprehensive muskaan, thanks. If I revisit clunies I'll come back to this. You've done it all , Jane :-) Your 25 Motif Challenge to learn new techniques threw up novel pieces ! Don't you think those who have been blogging for many years should have a regurgitation of some of their posts for later entrants/readers ? I think it will throw up a treasure trove of wisdom & ideas ! I so try to list my failures/mistakes alongside so that one can avoid making the same mistakes . Quelle coincidence! I've just been trying clunies last night! I saw on Portela Julie's blog her video and it inspired me to try again. I tried a piece rather than just a cluny or two and was disappointed in my lack of consistency (my model was Elisadusud so you can imagine the disparity). Thank you for all of this amazing and complete information. I'm inspired to keep trying. BTW, the Musée du Cluny is built on former Roman Baths so if you get a chance to go, don't forget to go down too, not just up to the beautiful medieval things and of course the Unicorn tapestries. It's one of my very favorite museums and now there's another reason for it! Isn't that great ! Julie posted her video a few days after I'd learned and it is Such a Great demo. I think of Elisadusud as the Queen of Tallies/Clunies & am in awe of her perfect, precise, elegant tallies & patterns. Haven't had the gumption to try any of her patterns, though I have printed out a few. Thank you so much Michelle, for this interesting info on the Musée du Cluny! Will definitely keep this in mind. I wonder if a virtual walk-through or some such is online ? Must check. Wonderful detailed notes! Thanks for sharing muskaan :). 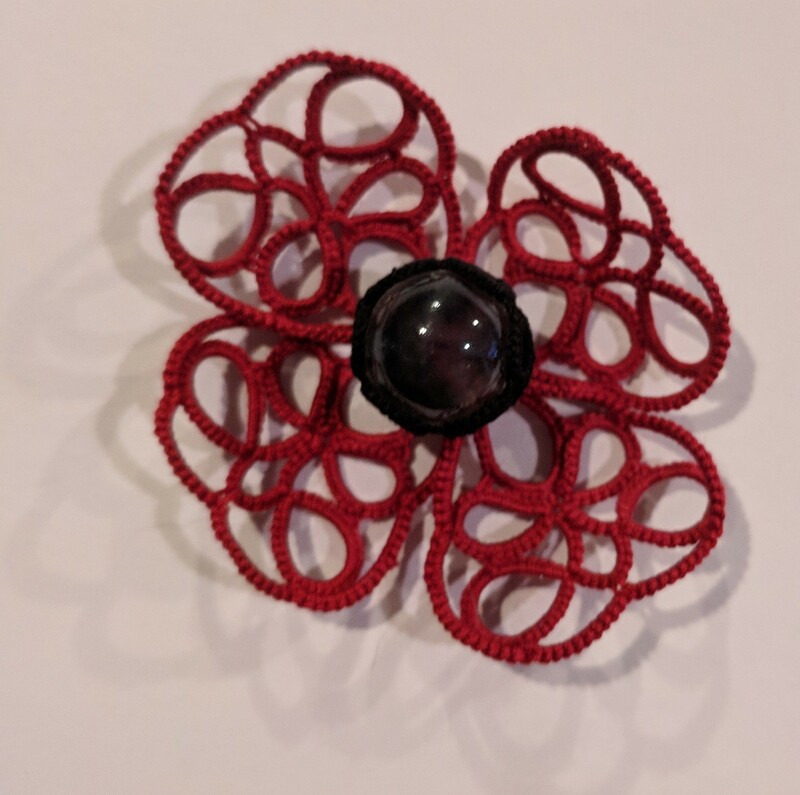 I'm distracted with other tatting projects but can't wait to get back to clunies after seeing this post :). Thanks Jenn :-) Will be on the lookout for your Cluny tatting works ! And there are more post(s) in the works with stepwise instructions on how to make multiple Warp tallies . Thanks for all your notes! I've just been looking into trying these; so glad I read this first. It's very nice of you to share your experiences with the rest of us and give us a few tips. Thanks soooo much! This is lots of work on you, and Thank you for referencing me. I do wind the thread unconventionality than other's directions, I feel it is less confusing and no aching hand or claw grip. I agree, most of the problems with any method is tension of the weaving. I think that looms and paper give a uniform look to it. But they seem to eliminate a "take it with you" way that I don't care for (personal). I do believe the more you make the better they look, and I really can make them so fast now that even wrapping around the finger doesn't take very long to make one, so that is no problem now. You do belt them out rapidly :-) And such long ones too ! You probably hold the record for the longest cluny !!! I was happy to have learned to finger loom - it helped understand & cement the concept, logic & engineering. However, personally for me, since I form my tatting pinch between thumb & middle finger, the cluny pinch was not always 'natural' to me. And that's why the card loom was probably more efficient for my style. I did try your method, too, in the initial stages :-) And I think because of this personal pinch issue & the fact that it was in initial learning stages, it was not successful. Later, after switching to card loom, I haven't tried it again. As they like to say different strokes for different folks ;-P That's the reason I've tried to include all resources/tuts I could find, even if I didn't use all of them myself. As for the post, yes, it has taken a long time, considerable thought & umpteen drafts & a bit of a tatting sacrifice (I am not tatting anything serious/experimental for fear of my thoughts moving on to other pastures ;-P ). Till I finish this topic, I'm simply doing small motifs, etc. from online patterns. 'Tatters' I can do without , although there might be a historical context to the application/use of this term. 'Cluny' I like - just sounds nice & colourful . I get a feeling there is some renewed interest in Cluny tatting, as witnessed in the many posts & mentions recently, including video demos. I do like the freeform shape of leaves & petals & hope to use it more often. I am delighted to be one of the tutorials you found useful. The Cluny is fascinating: it can be done in several ways in different craftarts. But I 'm not a big fan of the method on the fingers . My consistency is better with a support. Have you tried with support ? I like to have your opinion. Lilas, you have wonderful self-explanatory diagrams on your blog -- love them :-) Hope you continue your good work . After learning the technique on hand, I switched to a loom cut from card stock (thick card paper). Is that what you mean by "support" ? Yes, I find it Very convenient, more efficient, & faster than on hand. I also have more control over the loom threads & the cluny shape when I make it on the card loom. I had tried it on my bed mattress (with pins, like you did on the pillow). But cardstock is more pliable, & can be 'bent'/curved while weaving. I will be posting pictures & details in the next post. Ultimately, it is what each person is comfortable with - there is no One right or wrong way. The card loom that I made was from Judith Connors' tutorial. But the basics remain the same, whatever material you choose for support.